Manufacturer of a wide range of products which include roof ventilators for automobile industries. We are offering Roof Ventilators for Automobile Industries. The positive extraction of the ventilation system eliminates dust penetration and a down-draught into the building to ensure a cleaner and healthier working environment. 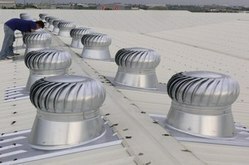 Looking for Roof Ventilators for Automobile Industries ?